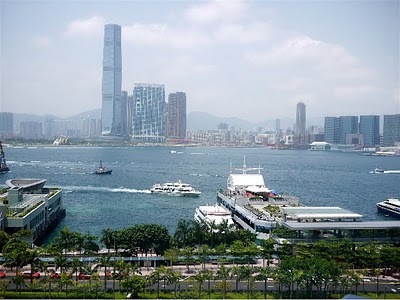 On a recent trip to China, I was fortunate enough to spend a few hours in Hong Kong. I decided to try Caprice and see what all the fuss was about. Located at the posh Four Seasons Hotel in Central, Caprice is one of only two Hong Kong Restaurants that has three Michelin Stars to its name (the other being Lung King Heen, also at the Four Seasons). So, what makes a restaurant deserve 3 Michelin stars? Is it the understated and elegant décor highlighted by Chinese inspired chandeliers? Is it the extensive wine list? Is it the creative and tasty dishes that use the best and freshest ingredients? Is it the impeccable service? Many restaurants around the world, to a certain degree, have these elements present. What makes Caprice worthy? I call it “subtle synergism”. Everything that goes on in the restaurant has to look completely uncontrived as if it is second nature. This is something that very few restaurants are able to manage, as it is very, very difficult to achieve. 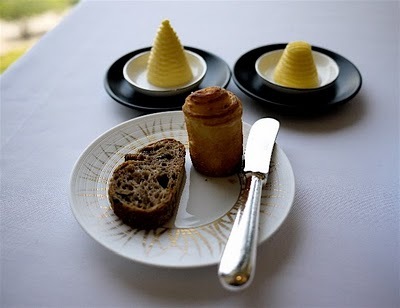 Head Chef Vincent Thierry and Restaurant Manager Jeremy Evrard, who both trace their roots to the George V in Paris, have been able to create a restaurant that has the best of everything, but does not overwhelm. This is subtle synergism at its best. Lunch is always a good time to try expensive restaurants. Most have a multiple course set menu that highlights the season’s chef’s specials at about half of what it would cost to have the same thing during dinner. 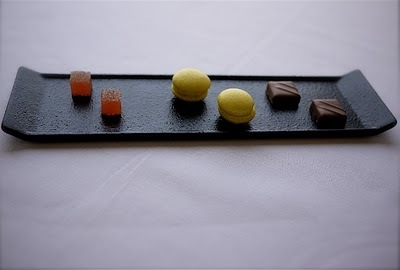 For Caprice, the Lunch Set costs HK$400 for three courses including coffee and petits fours. I for one could not decide what to have, so I left it to Mr. Evrard to give me his personal recommendations. 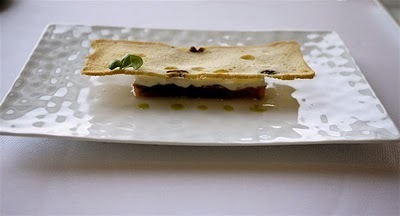 For my first course, Mr Evrard presented me with a Tomato Tart with Mozzarella and Parma Ham. To be honest, I thought that the combination would be too ordinary. I was pleasantly mistaken though, as the dish was surprisingly complex in flavor, with all three main ingredients complementing each other perfectly. I then moved on to my main course, which was Stuffed Guinea Fowl with Saffron Risotto with sides of Fennel and Natural Au Jus. Besides knowing that it was some form of poultry, I had no clue as to what a Guinea fowl looked or tasted like. As a rule, I normally do not opt for poultry as a main course as the flavors do not excite me as much as other meats. However, since I had decided earlier to place myself completely in Mr. Evrard’s capable hands, I just hoped that I would not be disappointed. The verdict: It was divine. The meat tasted like a sophisticated combination of Turkey and Chicken. Herb Butter was infused between the skin and the flesh giving the delicately tender slices the extra oomph that was needed to make this dish one of the best I have ever had. 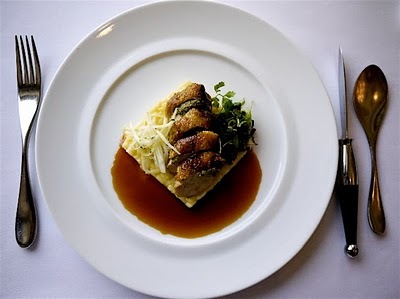 Stuffed Guinea Fowl with Saffron Risotto. Check out the funky Erquis silverware. Chef Thierry has always been known to whip up very creative and excellent desserts so I was very excited to try my Warm Apple Tart, especially when it was described to me by my server: “Warm apple tart consisting of a light pastry infused with apples; caramelized apple slices, cinnamon mousse, with a lime sorbet and a green apple coulis.” Being biased for anything apple I am normally not the right person to give an objective opinion. But, take my word for it, this dessert tastes even better than it looks. 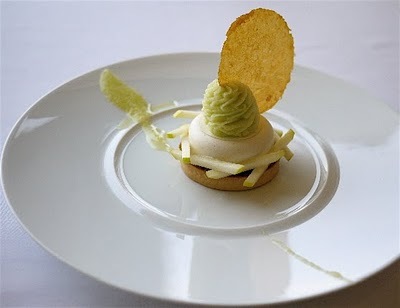 The pastry had just the right flakiness, the apples and the lime sorbet had the right tartness and the sweetness of the mousse was perfectly tempered. Having noticed the look of contented bliss on my face, Mr. Evrard graciously offered me another dessert to try on the house. Alas, I had to respectfully decline, as I was both extremely full from my meal and late for an afternoon appointment. I promised him though, that I would definitely be back for more of Caprice. No problem send me the bill but check your pocket first because your wallet is with me! Excellent food writing, Sanj. And the photos are absolutely stunning! Here's to looking forward to your next stop. By the way which tables serve the best salads? Thank you Rissa, That is a good question, I particularly like the salads at Cyma. Their salads are always fresh, quite healthy and tasty. Thanks for your support and keep reading! I'm not a foodie because of the complex jargon and numerous descriptions, textures, and flavors that go with tasting complicated dishes. However, reading this entry made me understand the foodie's world better, and it didn't make me feel like a moron who knows nothing about fine dining. Thank you! Thank you for your kind words Marie. All of us are foodies in varying degrees. I guess it is a continuous learning process. I am glad you enjoyed! Thanks and keep reading. Thank you for your kind words Marie. All of us are foodies in varying degrees. It is just a constant learning process I guess. Thanks again for your support! Keep reading!